I don’t run many 5Ks. There was this one, my first race ever, in March 2007. Then there was this one, in October 2008. I ran my third one yesterday. The CATnip Friday 5K (and Mouse Miler) is a benefit race for the Cat Adoption Team, “the Pacific Northwest’s largest nonprofit, limited admission cat shelter,” whatever that means. I’m sure it means that they are great people doing what they can to help our less-fortunate feline friends etc etc. Anyway, some of the folks I run with on a weekly basis are among the organizers for the CATnip, so that got me to sign up. This was the second year for the event; last year I was injured or had another race or some other good excuse, I’m sure. Either that, or I was just smarter back then. My old PR was 21:51. My goal this time was an even 20 minutes. Day-of-race, I wasn’t feeling all that optimistic about that goal. Why? The heat. It’s an evening race and the temperature was going to be somewhere near 90. My conditioning. Training for the 50 miler had made me slower, then recovering from my knee injury had me running fewer miles. A trial tempo run a week earlier — 2 miles at 6:45 — had proved very difficult. Despite these problems, I stuck with my goal. I was more interested in breaking 20 than I was in racing the best over-20 time I could yesterday. That meant I was going to try to run the race at an even 6:26/mile pace, and see if I could keep it up. 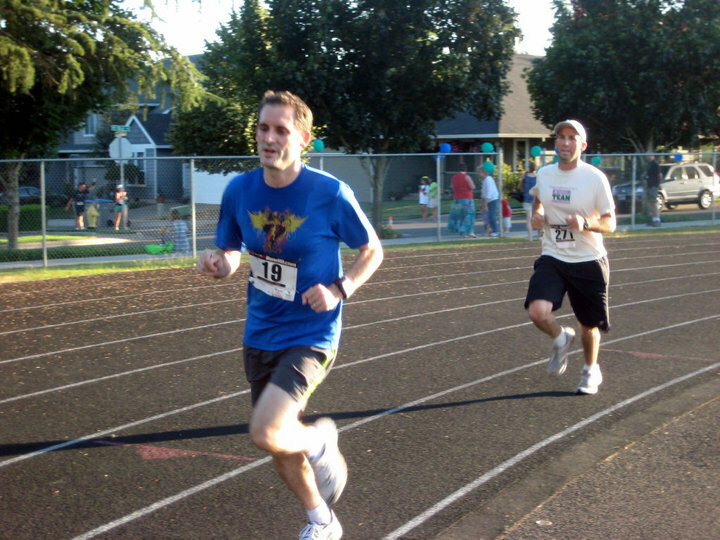 The race started and finished at the track at Sherwood High School. (Sherwood is a distant suburb of Portland, out past Tigard on 99W.) It was well-organized, well-priced, and came with a nice goody bag and a decent (optional for extra cost) shirt. The event was a little larger than I was expecting and everything seemed to run smoothly. Pre-race, I picked up my packet, pinned on my bib, talked with people I knew, used the bathroom, and kept cool with a large Slurpee I’d brought with me. Since the race wasn’t chip-timed, it was important to start near the front if you were interested in recording a fast time. The race was small enough that getting up to the second or third row of people wasn’t hard. The air horn blew and we were off. In just a matter of seconds, I felt awkward and tired. I looked at my Garmin and saw I was going out too fast. I slowed down some. Soon I was on the 6:26/mile pace I wanted. It felt difficult. I was breathing really hard. My legs didn’t feel like they were moving too fast, but I couldn’t get enough oxygen. My GPS registered one mile after the course’s one-mile marker. I think the course measurements were pretty accurate (I know the guy in charge of them and think he’s probably good at it), so that meant my actual pace was more like 6:18/mile. Whether this was good news or bad news was an academic exercise; I was already starting to just hang on for dear life. I found myself running about 20 feet behind a guy from my running group. For the next two miles, I’d maintain that 20-foot gap. Unfortunately, we were both slowing down. My Garmin-measured split for mile two was 6:45; I imagine my real split was 6:40 or so. Toward the end of mile two we hit the first bike path segment; one or two sharp turns added to the challenge. Mile three had a lot more bike path and also some short but sharply steep uphills. If miles one and two had me feeling “why am I breathing so hard?” tired, mile three hit me with “why are my legs slowing down?” I was overheated, breathing as hard as I could, and on the edge of giving up. My time for mile three was somewhere around seven minutes even. Not. Pretty. Finally we hit the high school, then the track. I glanced at the official time — if I could run 3/4 of a lap in 30 seconds, I could break 20. Ha, ha, right. I didn’t have enough left in me to even pick it up a little until the last 50 yards, when I think I managed to hold off someone who was gaining fast. I collapsed onto the soft artificial turf of the track infield. My lungs hurt. My watch read 20:35. 5Ks are awful. I’ll keep trying until I break 20, though? Why? I have absolutely no idea. Update: Official results — 20:34 (6:37/mile). 25/180 overall, 24/93 men, 8/23 men 40-45. This entry was posted on Saturday, August 14th, 2010 at 1:27 pm and is filed under race reports, running. You can follow any responses to this entry through the RSS 2.0 feed. You can leave a response, or trackback from your own site. Hey, I just wanted to thank you for the great, walk/run calculator.. it was exactly what I was looking for!